this is bbc news. i'm geeta guru—murthy. the headlines at 11 o'clock. side, and arguments is put to one side, and there will be a truce that will last one of the world's most famous landmarks, through easter. 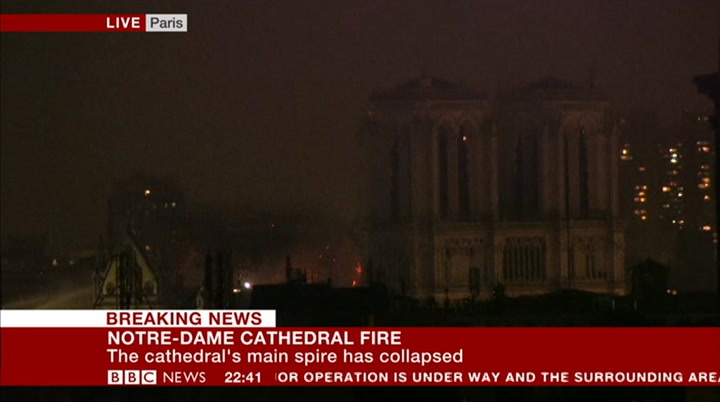 he quite rightly notre dame cathedral in paris, has been engulfed by fire. decide if you cannot talk about political reform, economic change firefighters say the building's structure and its two main towers and so on on a night like this. he have been saved. said the right words. it's what people will have wanted. there was but much of the roof has been destroyed and the main spire over talk of a big demonstration in paris the transept has collapsed. 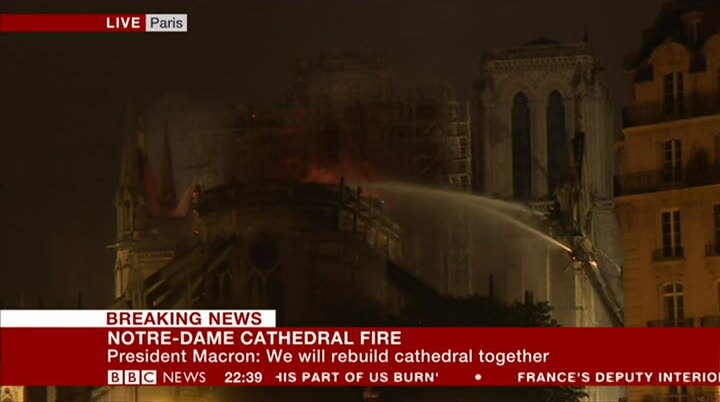 this coming saturday which would president emmanuel macron earlier have been a response to his words visited the site and said in the last half hour — tonight will i expect that will be "we will rebuild". 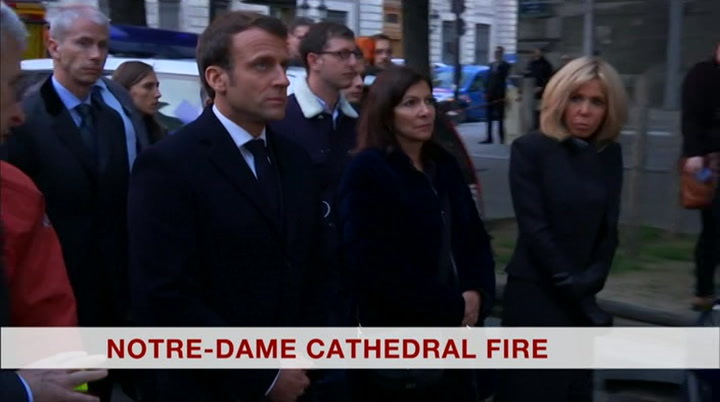 and these are live pictures called off out of respect, because of the fire at the 850—year—old gothic building. people won't have their heart in it. 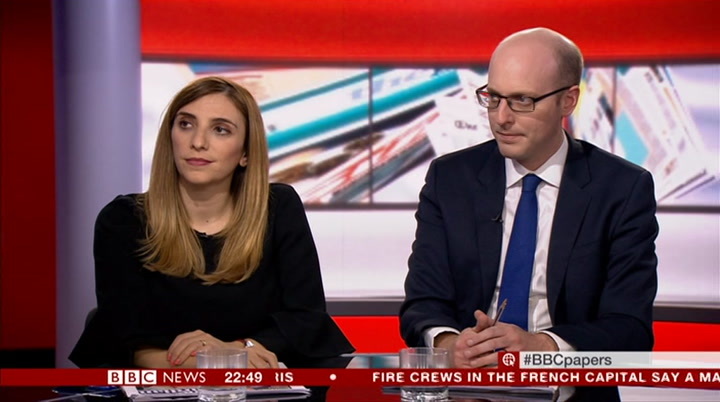 and at 11.30 we'll be taking an in—depth look that will not sweep to one side the at the papers with our reviewers jessica elgot and steven swinford — whole context of the yellow vests. stay with us for that. they will be back. hugh schofield in paris, thank you so much. 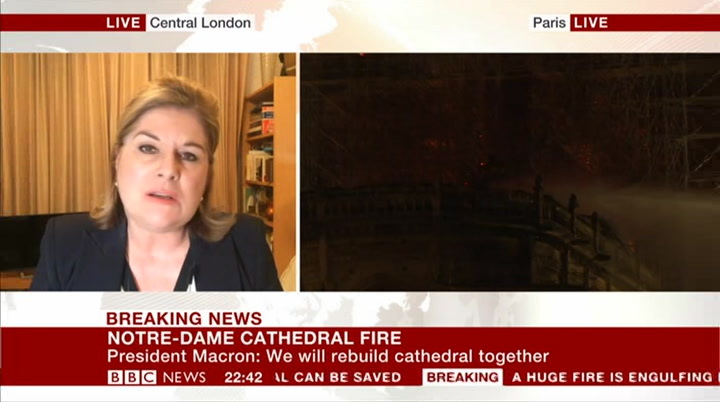 we can bring in benedicte paviot, who is the uk correspondent for france 24. i don't know if you are able to hear those statements in full, in particular from those statements in full, in particularfrom president those statements in full, in particular from president macron. the guardian, and steven swinford, deputy political editor from the telegraph. thanks very much to both of you for coming in. let's have a look at the front pages we have tonight. 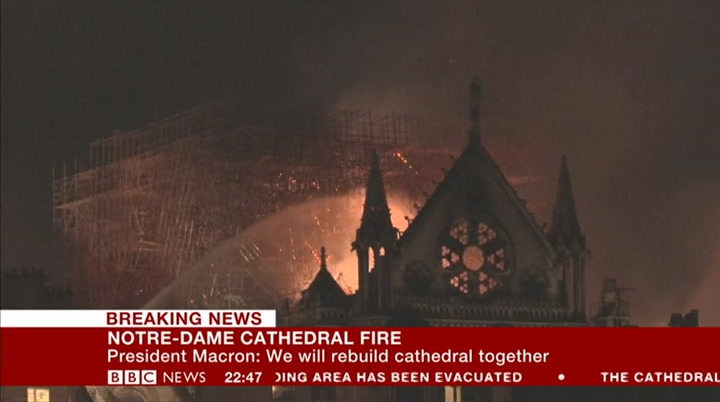 the guardian leads on the fire of notre dame, saying it could be linked to building work that was under way. 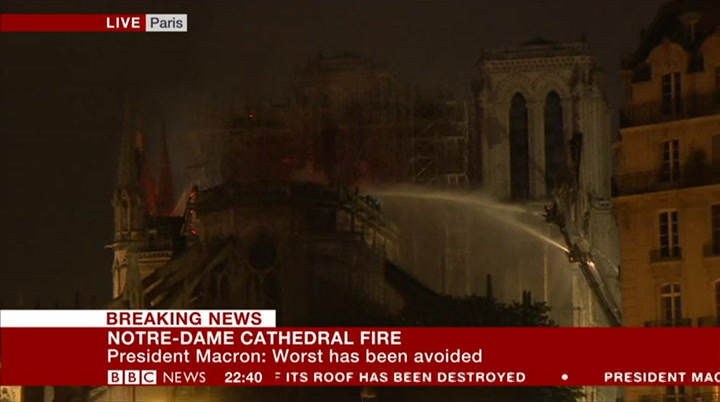 the financial times is also focusing on the blaze — calling the cathedral one of france's best known structures and one of the most visited places in the world. 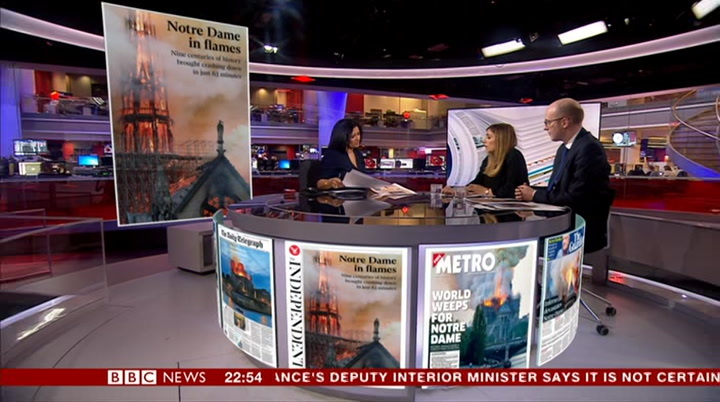 the i dedicates its front page to a picture of notre dame's tower in flames — before it later collapsed. 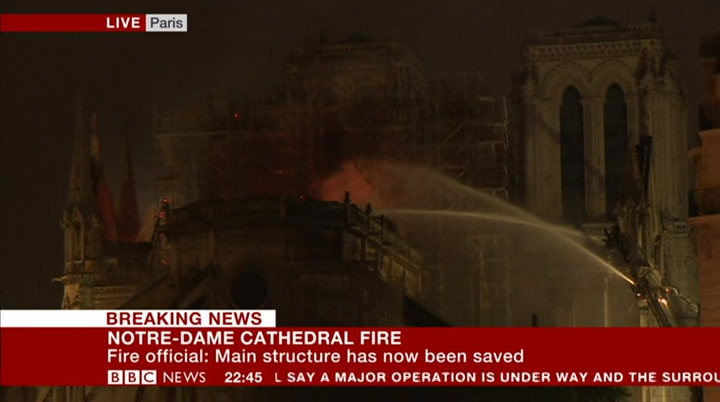 the telegraph shows a picture of the beloved cathedral in flames over the river seine. it talks about the impact this has had on the people of paris. the metro, too, leads on the fire, with a picture of smoke billowing into the sky and crowds watching from a bridge over the river seine. 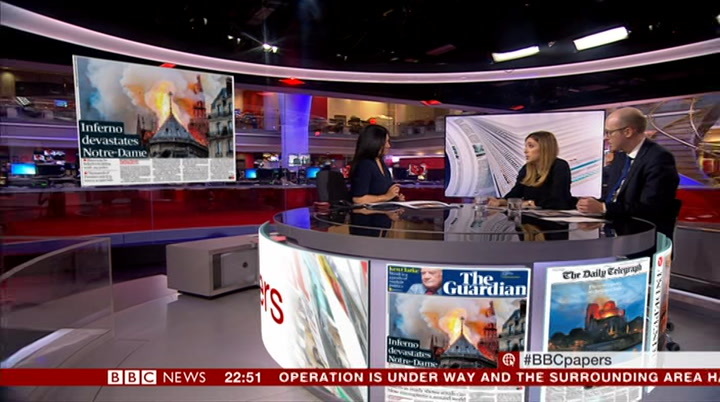 the daily mail's front page is covered by a picture of the cathedral in flames. it talks of the history that has been lost. 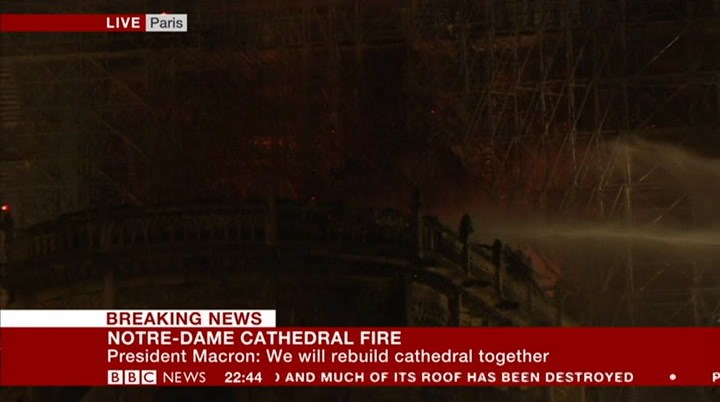 the sun writes "notre doom" — with a shot of the tower falling apart amongst the fire. the daily express looks at statins — saying three people aren't reaping the rewards of the drug. let's have a look at some of the papers. the guardian. a very powerful headline, and the image. papers. the guardian. a very powerful headline, and the imagem is expert energy cd details in that photo committee flames going up that -- it is photo committee flames going up that —— it is extraordinary seeing the details in that photo committee fla mes details in that photo committee flames going up. from what we are hearing earlier, the building and risk of collapsing, it was very disheartening to feel that, hard to see anything but sorrow in these pictures anyway. the telegraph has got a pretty powerful right up on his front page. again, a very powerful image with the river and a boatin powerful image with the river and a boat in front. it's got quite a lot of detail onjust one boat in front. it's got quite a lot of detail on just one person saying the saddest thing they have ever stood and watched in their life. 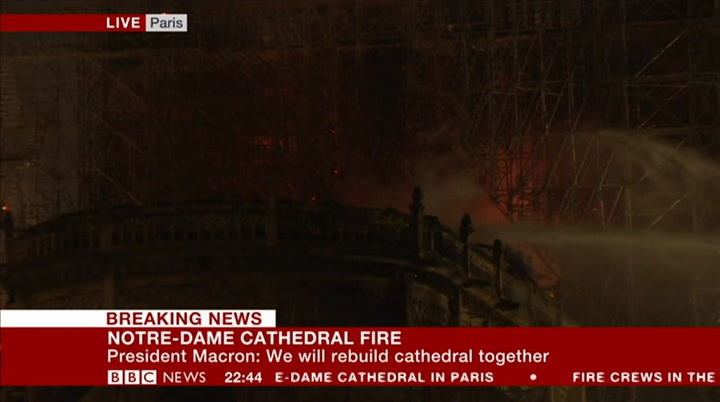 extraordinary job seen, seem to have done an extraordinaryjob of containing the fire and they were praised by president macron. hopefully not in that direction. we will see. jessica, steven, we'll see you in an hour's time, hopefully with more time, to look at the newspapers. we'll be at half past 11 for another look at the papers. the front pages are on the website. 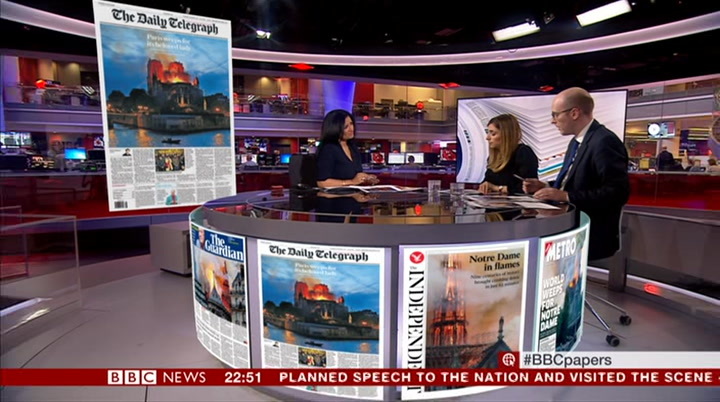 and if you miss it any event, the papers are on the iplayer. thank you very much. hello there. 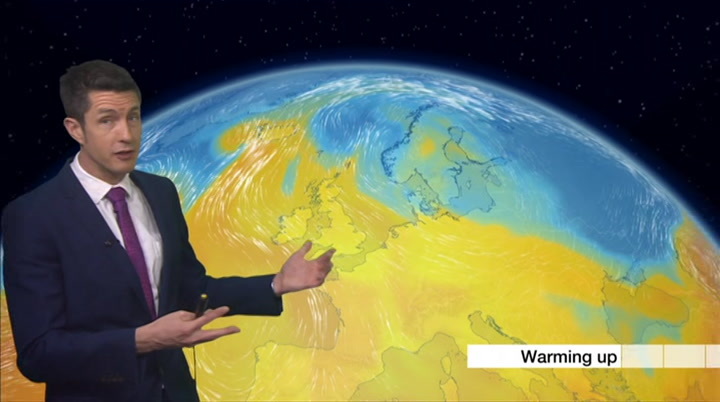 our weather is set to get much warmer over the next few days, as we replace the chilly easterly winds that have been coming in from scandinavia with something much warmer moving in from the southeast. 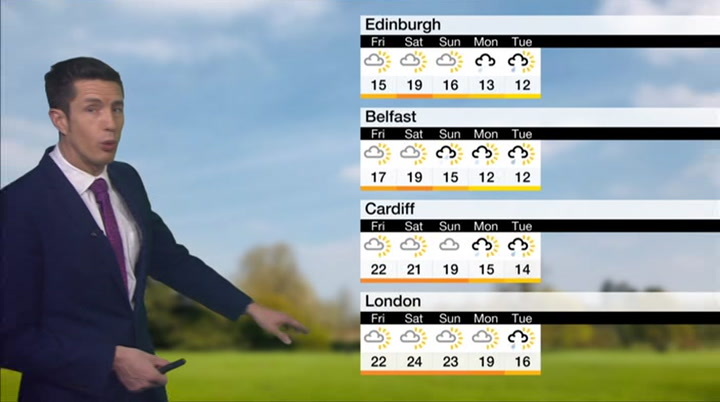 so that's going to boost the temperatures as we head into easter weekend. the warmest spots could see temperatures climb as high as 25 degrees celsius, so feeling really quite warm at times for the weekend ahead. before we get there, we've had mixed fortunes weather—wise today. the best of the sunshine has been across england, eastern parts of wales and eastern areas of scotland. but it's not been like that everywhere. 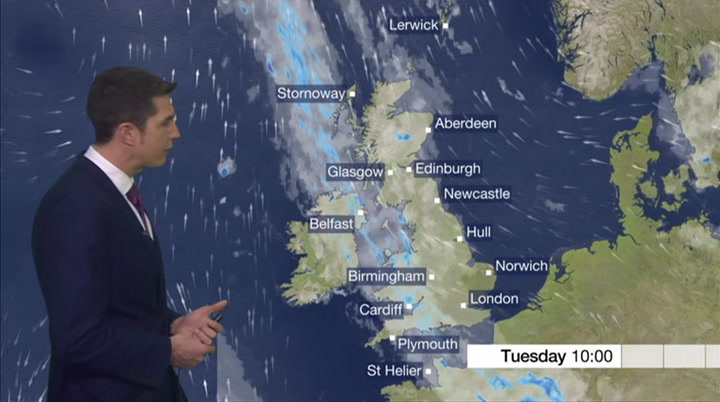 across western parts of the uk, the cloud has been thicker and we have seen outbreaks of rain. the rain accompanied by strong winds across these western areas, too, bringing rough seas to the coastline around northern ireland, where we've also had some damp weather. the winds really feeling quite cold with those gusts up to around a0 or 50 mph. overnight tonight, the same band of rain still with us and going nowhere fast. so there will be more rain at times in northern ireland, some rain dribbling its way to parts of wales and southwest england. with a lot of cloud expected overnight, it's not going to be as cold as last night. 25 celsius before things turn cooler next week.